Notes: The House Sparrow was introduced into the United States via a release in Brooklyn in 1851 and by the turn of the century had already spread to the Rocky Mountains. 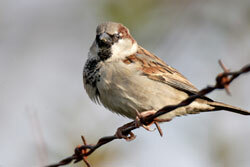 House Sparrows are stockier with thicker bills than native sparrows. They are generally found close to people and are absent from less populated areas. They are one of the few birds that almost everyone, even in the densest of city settings, has the opportunity to study. House Sparrows are unpopular with many, since their aggressive competition for nesting cavities has led to the decline of many native species including the Purple Martin. But there is much that is fascinating about them. The Cornell Lab of Ornithology reports that a House Sparrow can swim when necessary, even to the point of swimming underwater to escape a trap! 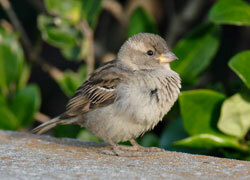 More information about the House Sparrow.